In medium bowl, combine dressing ingredients; blend well. 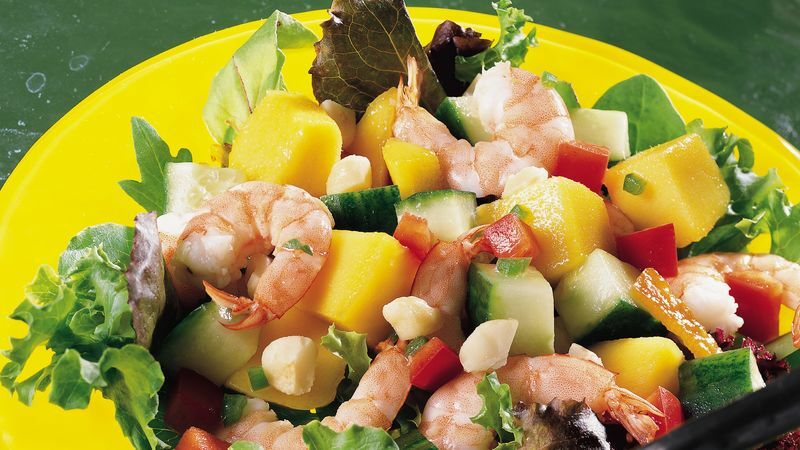 Add shrimp, cucumber, bell pepper, mangoes and chile; toss to coat. Arrange salad greens on individual serving plates. Spoon shrimp mixture onto salad greens. Sprinkle with nuts. If fresh mangoes aren't available, you can use sliced mangoes from a jar found in the refrigerated produce area of the grocery store. Or use 2 large ripe fresh or 4 canned peach halves instead of mangoes.